The BBC alleged that millions of pounds raised by Band Aid had been diverted to rebels in Ethiopia. THE BBC HAS been forced to apologise to Band Aid over allegations that millions of pounds raised by the organisation had been used to arm rebel militia groups in Ethiopia. A report on the World Service’s Assignment in March claimed that large sums of charity money had been diverted to buy arms for rebels in Tigray province. The report did not directly link Band Aid, headed by Bob Geldof, but other BBC outlets suggested its money had been involved in buying weapons for rebels in 1985, the year Live Aid took place. We also acknowledge that some of our related reporting of the story reinforced this perception. The Band Aid Trust complained to the BBC after the programme aired in March saying it and subsequent coverage by Radio 4 and BBC News gave the impression most of the money raised by the charity had been diverted. 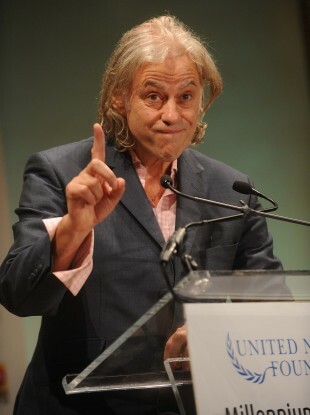 Geldof’s relationship with the BBC was damaged by the allegations. He previously held the organisation in high regard for its initial reports about Ethiopia’s devastating famine which prompted him to set up Band Aid. This was an unusual lapse in standards by the broadcaster and, most critically, the World Service. It was Michael Buerk’s frontline reports for the BBC from Ethiopia which prompted me to act and establish Band Aid in the first place and I recognise the important journalistic and humanitarian role the BBC has played in our story. We welcome the BBC’s apologies and hope that the public corrections can begin to repair some of the appalling damage done, and move forward. Apologies are being broadcast across BBC outlets today and the programme is no longer available on the organisation’s website. Email “Sorry Bob! BBC apologises over Band Aid claims”. Feedback on “Sorry Bob! BBC apologises over Band Aid claims”.